Since its release back in 2007, Apple’s iPhone has evolved leaps and bounds, but dual-SIM support has never been on the cards for the Cupertino giant, and we believe that this is unlikely to change well into the future as well. The love for the iPhone is unwavering, but what do you do if you really need to connect to another network and carrying another phone is just a hassle? You dabble into the dual-SIM adapters market. It actually makes perfect sense that a lot of consumers want this type of functionality in their iPhones. Professionals who have a personal and work SIM, travelers who have a domestic and foreign account, there’s definitely a market for it. Here we’re going to take a look at three relatively low-cost products that enable dual-SIM functionality in Apple’s latest iPhone 6s and iPhone 6s Plus. This one is the most interesting of the lot. The ‘Fonrest APP Phone’ is one potential innovative solution that has based its functionality and USP on being portable. 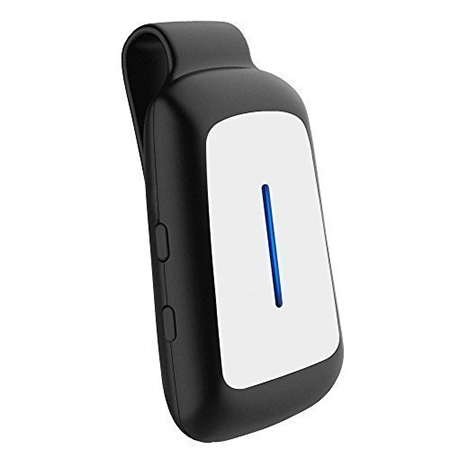 The product is essentially a smart Bluetooth dongle that accepts your second SIM card and can work in conjunction with the iPhone wirelessly within 10 meters. There’s also the added functionality of it acting as a “selfie” remote to capture photographs, and even acting as an anti-lost alarm if the distance between the iPhone and the device exceeds 10m. This device is good for up to 3 hours of continuous talk-time and has a standby time of 42 hours. Do note that the contraption is only compatible with GSM SIM cards, so in case you have a CDMA SIM, you should use that in your phone. 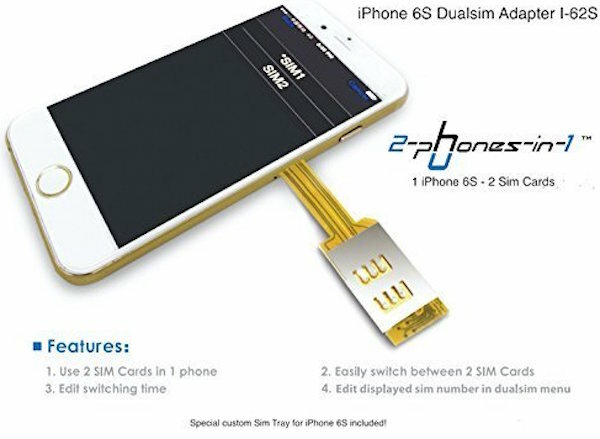 So, as long as you have this device in your pocket or in your back-bag, it should provide dual-SIM functionality to your iPhone via Bluetooth connectivity. Genius! If price counts for the premium nature of a product, then this little dual-SIM adapter should be considered as one of the better and more functional options. 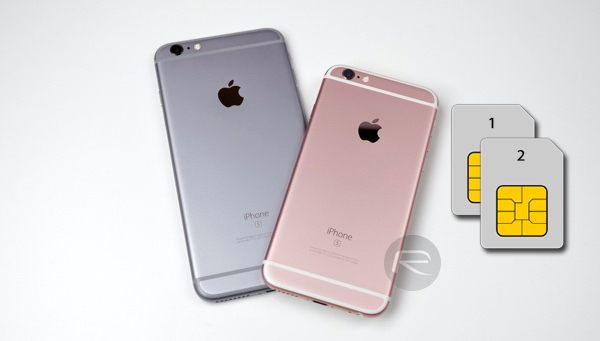 The product comes with a custom made special SIM tray that slots into the iPhone 6s/6s Plus. It also has the ability to run two SIM cards simultaneously, allowing the user to switch between SIMs through a dedicated menu. There are also additional trays for those that have older devices and want the same functionality in Apple’s iPhone 6/6 Plus and iPhone 5/5s. It comes with a case as well. In direct contrast to above, if you believe price is an indication of quality, then this little option may instantly be ruled out. But it still gets the job done nevertheless, and you never know, sometimes you do get an absolute bargain. 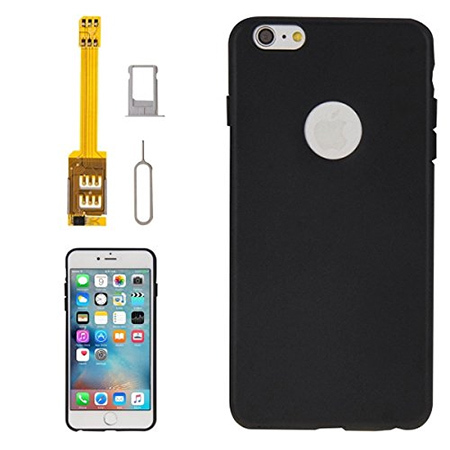 This little purchase comes with a dual-SIM adapter, a TPU case, a SIM tray holder, and a SIM tray holder ejector key. It also offers auto-switching between the two SIM cards that are being used, and you can also schedule the switch time. It looks to offer the same level of functionality as products that command a higher price-tag, but we’re guessing that the difference may lie in the actual build quality. Also, the shipping time of this product is one-two months which is kind of a deal breaker if you want to immediately get your hands on one. Wow I had no idea that the little adapter tab was a thing! That thing is incredible! I was thinking of something similar before clicking the article, but was wondering how it would be done. This pretty much means that any phone can have dual sims, all you need is a little adapter tab, and a case! My income for this week is 7700 dollars. More than a year ago I was jobless ,,zv with zero bank credit and that was terrifying. I do thanks to one of my friends who revealed to me a way how I was able to gather myself and making average of 65 d an hour. It was life changing . Look here for details. The wired dual SIM adapter will only allow you to have one SIM online, at a time. It will stick out of your phone and can obviously lead to damage to the device. Not to speak of the looks. The wireless solution is basically a second phone with its own radio circuit and its own battery. You actually do carry a second phone with the iPhone serving as a front end to it. If you need a dual SIM phone, why don’t you simply buy one? Or simply use your “old” iPhone/Android for the second line? The “solutions” are quite the hack. Just get a phone that properly support two SIM cards. As long as it’s not dual stand by it’s almost useless. As for the bluetooth, ther is a jachet with same function and battery. Until iphone will not have a real dual sim solution, i will be suffering on Android…And I miss my Iphone.. I am using Android because some phones offer true dual sim capability. You don’t have to switch them on and off manually and people can call or SMS on either number at any time. I may well move to Apple if they have proper dual sim capability. In the meantime, the kluges shown are almost useless compared with Android dual sim functionality.